Shona is one of two 18″ dolls I bought over summer 2013 to help me ensure that clothing from Kit’s Couture will fit other 18″ dolls as well as American Girl. 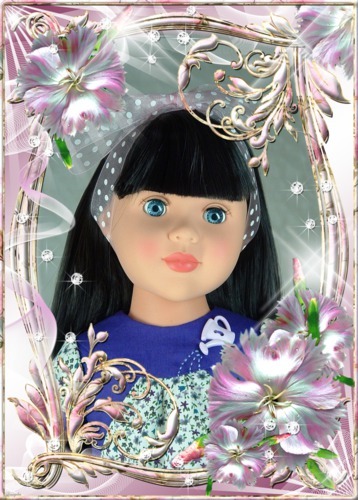 Shona’s out-of-the-box name is ‘Fashionista’, and she is one of the Favorite Friends dolls from Madame Alexander. Shona is a beautiful young lady, a true Winter with her dark hair, green-blue eyes and pink-toned skin. She looks wonderful in the jewel colours and pale ice pinks and blue tones of that season. She was supplied dressed in a really snappy outfit created by the young fashion designer Cecilia Cassini: a dark pink mini-dress, white-spotted black tights and wonderful leather-look books and jacket. To complete the outfit she wore a dark pink hairband with an extravagant rosette on it. She comes with a blue-eyed white cat that is frankly so unattractive that I left it in the box. Her construction is different from American Girl in that the top of her body is a vinyl shoulder-plate. This means that she looks great in lower-cut necklines, halter necks and so on. Her soft pink-toned ragdoll body is stitched to the shoulder-plate. She has a softer stuffing than American Girl and as a result she is slightly less stable when standing. More importantly from a couture perspective, her body, arms and legs are slightly slimmer than American Girl’s, which means that some styles of American Girl clothing patterns can be a little too roomy on her. Another major difference is that she has rooted hair rather than a stuck-on wig. The rooting is good, and her hair is incredibly silky though I doubt it would be wise to wash it. Her head tilts beautifully, which raises her cuteness quotient when posing. Given that she retailed at about half the cost of an American Girl, I think she is good value and very appealing.